After a steady stream of pulse-pounding issues filled with SHOCKING new developments, time travel, explosions and deaths, Superior Spider-Man #20 is a necessary step back for the series and a reminder that even if Peter Parker is “dead,” the rest of his supporting universe is very much alive and entertaining. It could be merely coincidence, but I think it’s worth noting that Dan Slott penned the last one of these “day in the life” type stories 10 issues ago, immediately following the seismic “game-changing” Superior Spider-Man #9. I don’t know if that means we should expect another cool-down issue in Superior Spider-Man #30 (which, if I do my math right, is the penultimate chapter of the already hyped “Goblin Nation” arc), but I do think these kinds of issues are critical to the success of a Spider-Man comic book series, regardless of who is operating as the man behind the mask. 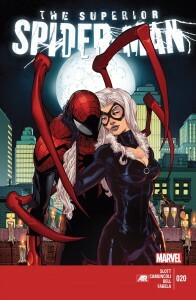 What was especially worthwhile about Superior Spider-Man #20, was that by stepping away from dire, end-of-the-world Spider-Man scenarios, Slott put a lot of his creative focus on the women in Peter’s life – who, outside of Ana Maria, have suffered from being under-written for some time now. Not every female got a chance to shine. 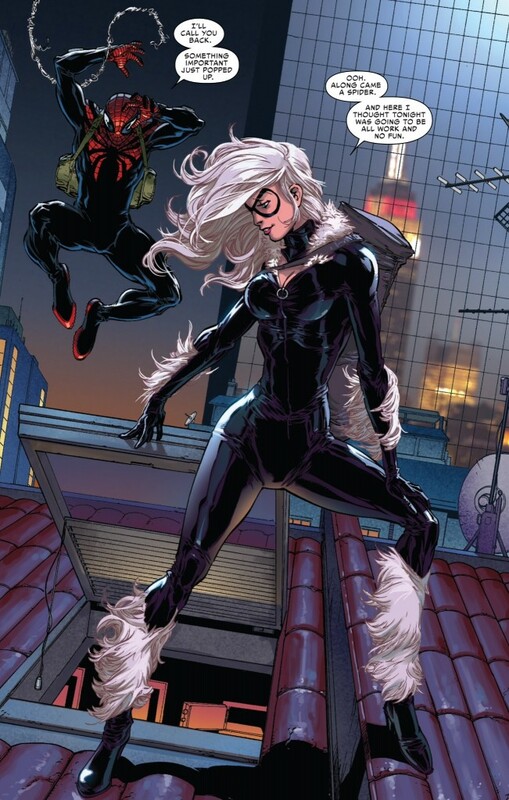 In fact, the woman on the cover of this comic, Felicia Hardy, aka, the Black Cat, most certainly got the short shrift (despite her “I won’t forget this spider” vow of vengeance after Spider Ock punches her in the face and webs her up for the authorities). But I found myself shaking my head in agreement during certain scenes with Aunt May and Mary Jane because I was very happy to see these two Spider-Man cornerstones get such well developed character moments. In her own quiet way, Aunt May may have had the strongest moment of all as she scolded Peter for his obnoxious display of pride while her husband co-signed on a loan for the launch of “Parker Industries.” One of the big complaints from some member of the Spider-Man fan community since the Superior status quo was launched earlier this year was how all of Peter/Spider-Man’s supporting cast members have either been too oblivious or ambivalent to notice his change in personality. 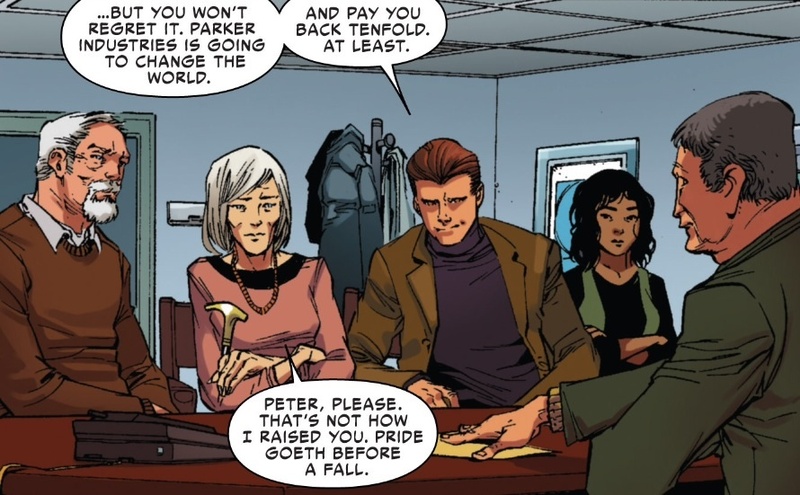 May’s “pride goeth before the fall” line is not only extremely prophetic (and perfectly captures the direction this series is going at this stage in the game), but also demonstrates some semblance of recognition from a loved one that something just isn’t right with Peter these days. I have zero expectation about Aunt May being the one to corner Peter about actually being Otto Octavius, but Slott’s writing of May reflects elements of how her character was portrayed during the Stan Lee/Steve Ditko and Lee/John Romita Sr. glory days. While May was usually either sick or worried about Peter during the Silver Age, she would also have moments of extraordinary insight and perceptiveness, seemingly out of nowhere (including one of my all-time favorite moments here). 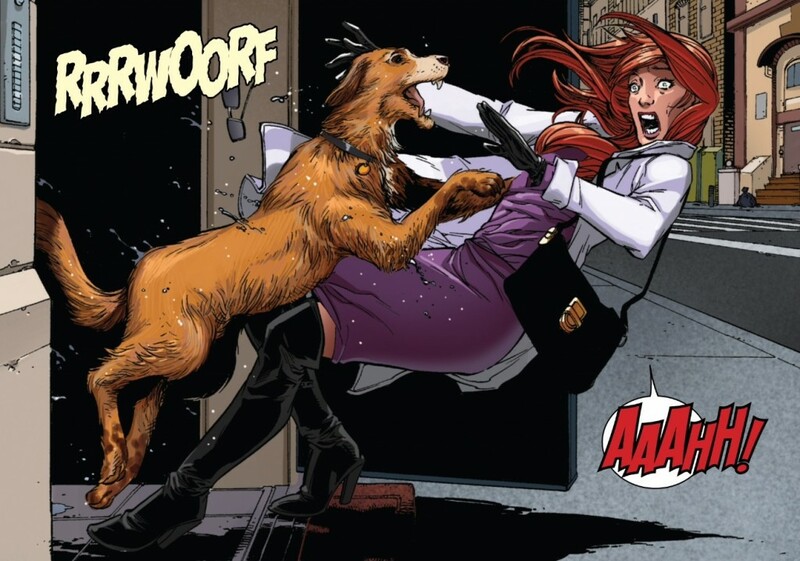 MJ’s “B” story is a bit more frivolous in tone (and ended with her getting ambushed by a very friendly firedog in sitcom-my fashion) but still marks an important development for her character. One issue after telling Peter to get out of her life for good, MJ makes good on that promise, even busting out the “face it tiger” line for her beau-to-be (before getting slobbered on by the dog, of course). Since Superior Spider-Man began, Slott’s characterization of MJ has frustrated me the most because she was continually coming across as being excessively dependent on Peter. When she was potentially getting back together with Peter in Superior Spider-Man #2, it was Otto/Peter who eventually put a stop to things, and every subsequent MJ appearance mainly consisted of her coming across as jilted or frustrated with Peter. 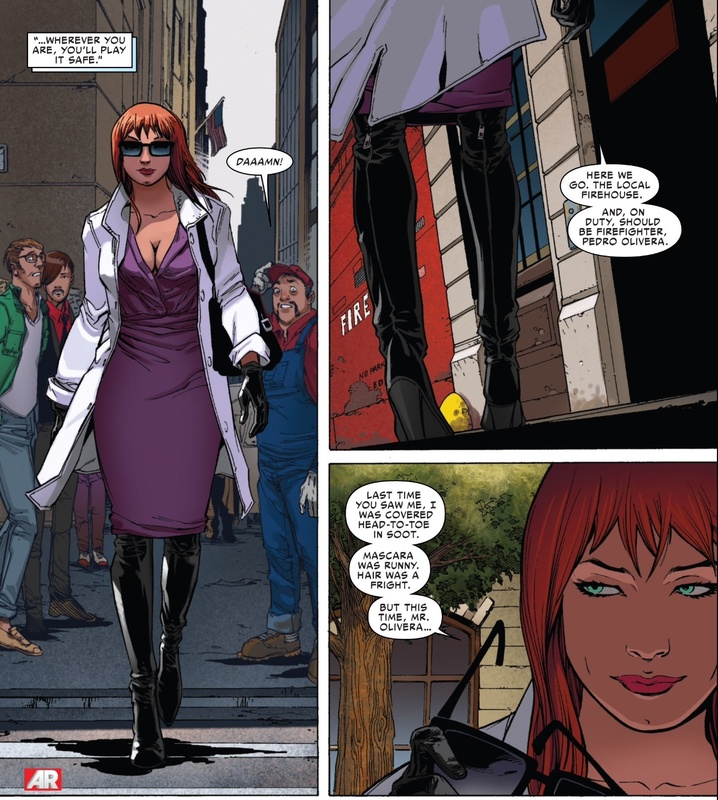 She even sat helplessly as her nightclub burned down around her in the aforementioned Superior Spider-Man #10. Mary Jane is far from a flawless character, but I do think she is much better than what we we’ve been getting the past 10 months. Having a confident MJ putting herself “back on the market” and make an effort to move past Peter is more in line with what I expect from the character at this point of the story. I’m glad Slott finally pulled the trigger on the MJ/Pedro romance. Also worth noting, as I think it adds a lot to the MJ scene, is Giuseppe Camuncoli’s artwork. I’ve always found Camuncoli to be technically solid, but a little stilted and emotion-less. However, his work on the non-costumed elements of the Spider-Man universe were absolutely stunning in this issue. Nothing against Ryan Stegman and Humberto Ramos, but Camuncoli’s MJ is an absolute knockout (and his Black Cat in that splash page I posted above ain’t too shabby either). Even Camuncoli’s Anna Maria is fantastic. She looks much more realistic and less like a child compared to the other visual interpretation of the character we’ve seen on the book. While I haven’t voiced this opinion explicitly yet, I haven’t been a huge fan of the rotating artist schedule of Superior Spider-Man because just as my brain has been getting used to a certain visual tone and style (and Stegman, Ramos and Caumncoli are all considerably different from each other stylistically), the whole thing is switched up on me. And yet I think Camuncoli’s work on Superior #20 demonstrates how different artists for different arcs can be very effective. For me, in these character-driven stories about real people who don’t wear capes and costumes, it’s critical to have an artist who is less stylized. No disrespect to Stegman and Ramos but their real people can periodically look a little too cartoony and inconsistently drawn; to the point that it’s distracted me from the actual story sometimes. With Camuncoli, I buy into every major character moment with this cast because I’m not sitting there examining the anatomy or somebody’s odd facial contortions. I could practically hear Roy Orbison’s “Pretty Woman” playing in the background as MJ walks down the street in this comic. When songs start popping into your head while you’re reading a comic, you know the story and the visual are clicking on all cylinders. Of course, this being Superior Spider-Man, the comic book wasn’t completely without any gasp-inducing moments, though unlike the last nine issues, Superior #20’s big reveal did not involve Spider Ock. Instead it’s Otto/Peter experiencing the bitter taste of failure as he’s denied his doctorate for plagiarizing the great scientific research of one, Otto Gunther Octavius. 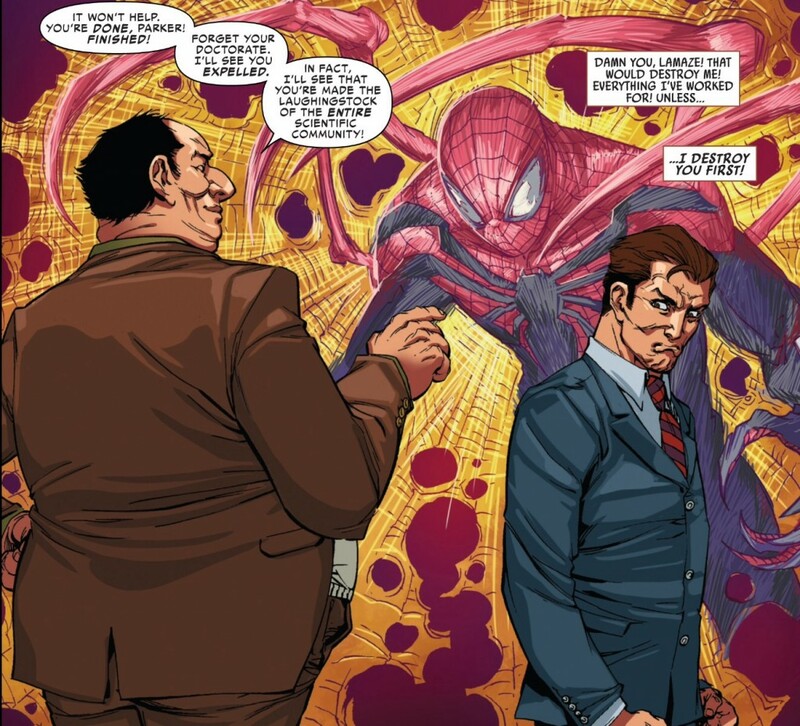 It’s a wonderful payoff from Slott for this his long-simmering “I’m going to get my doctorate” arc for Otto because it not only sets up some intriguing tension for the series (how far will Otto go to gain vengeance for this rejection), but it’s also completely realistic and plays into the character’s personality expertly. Of course Otto is oblivious and arrogant enough to plagiarize himself. And because he unknowingly suffers from the same superhero/personal life balance that has crippled Peter forever, Otto doesn’t have the wherewithal to realize how ill-prepared he is for the biggest day of his educational life. While Slott seemingly prides himself of burning the whole forest down around him when he writes, these smaller, character-driven pieces are still some of my favorites issues that he works on because they demonstrate just how much of a fan he is of the Spider-Man universe. There’s love and appreciation for every single one of these characters (save maybe Black Cat, but I trust Slott has put a pin in that storyline thread) in Superior Spider-Man #20 and Slott’s joy for being the guy who writes Spider-Man oozes from the pages. With Stunner making her big return in the next issue, and then a major Venom arc that transitions into the Goblin showdown, I assume this will be the last of these stories for a while, but I trust Slott will continue to sprinkle these moments in as we get to (what I anticipate to be) an exciting climax for Superior Spider-Man. I haven’t read this issue yet, but I just wanted to say personally I think Camuncoli should be the only artist on this book. I’ve felt that way since he started drawing in Amazing.